The Skinny: There are bad movies. There are worse movies. Then, there is Never Compromise. by Kozo: I apologize in advance for my lack of professional conduct in regards to the cinematic wasteland known as Never Compromise. This movie is complete crap. It's produced by the world’s worst producer, Jackie Ma, who doubles as the world’s worst actor too. Ma plays a random associate of star Francis Ng in this pointless crime drama about two old buddies (Francis Ng and Simon Lui) who kill a family of 7 and are chased by clueless mainland cops. Zero pacing and storytelling permeate this needless exercise masquerading as crime drama. 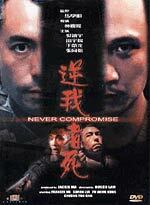 Note to Francis Ng: why did you appear in this film? This is possibly his worst performance ever. Ng plays a complete psycho, and he brings zero nuance and inner life to his moronic character. He simply bugs his eyes out and does that Ugly Kwan voice. I weep, because Francis Ng is actually a marvelous actor.